Wow — I haven’t posted since March. Time to rectify that. 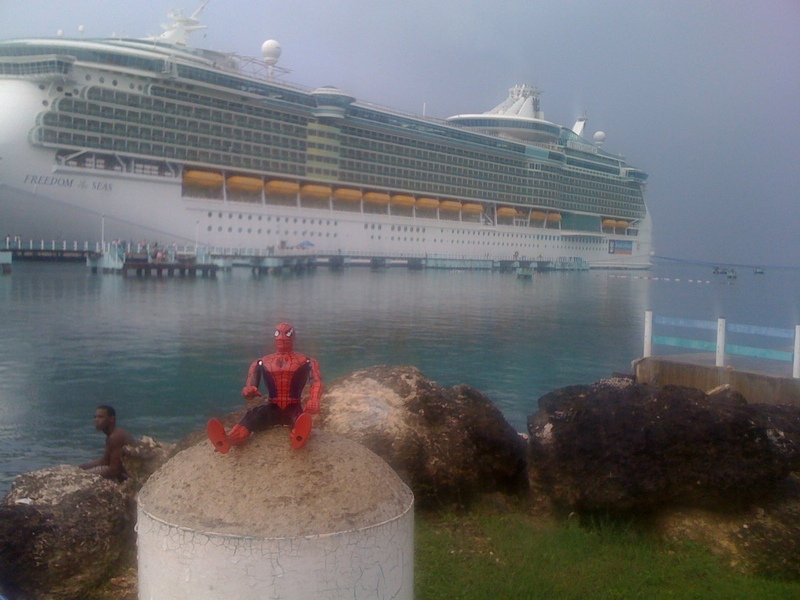 The Spidey family is back from a 10-day vacation to Orlando and the Caribbean. We had a blast. We are Disney veterans. Our nearly 15-year-old son thinks he’s been to Disney World at least 8 times, which doesn’t include Disneyland Paris, Disneyland or Tokyo Disney, where we’ve been also. Nonetheless, we have a good time whenever we go. This time, we only spent three days in Orlando before heading to Port Canaveral for a week-long cruise on Royal Caribbean’s Freedom-of-the-Seas. Wow! This is one of those massive ships with an ice skating rink, rock walls, and on-deck surfing and boogie boarding. We went to RC’s private beach in Haiti, to Jamaica, Grand Cayman and Cozumel. We gained weight, drank our share, and lost money in the casino. We needed naps when we got home two days ago. While on the trip, I started and finished The Girl with the Dragon Tattoo. I highly recommend it, and it’s under $8 for the Kindle. I’m actually glad I was on a ship outside the U.S. and couldn’t download the next book in Larsson’s series. I would have gotten sucked in, and I need to finish other books. The primary one of those books I’m trying to finish is The Happiness Project by Gretchen Rubin. I had been listening to the audio version on the treadmill, but I decided I’d rather read it and bookmark some spots for reference. In this book, Rubin writes of her 12 month experiment to increase her happiness. I think we can all learn a lot by reading how she deals with “midlife malaise,” which isn’t really unhappiness or depression, but, as she writes, “a recurrent sense of discontent and almost a feeling of disbelief.” That certainly describes me some days. In her chapter on March, Rubin describes how she launched her blog (www.happiness-project.com) and committed to posting every single day as a challenge. I’ve also read Ted Leonsis’ book The Business of Happiness, in which he writes that finding outlets for self-expression is an important component of happiness. Now that I’m back (and still embarrassed at the 10-week absence of posts), I’m going to take the same blog challenge of posting every day. Which means – more tomorrow. Come back.